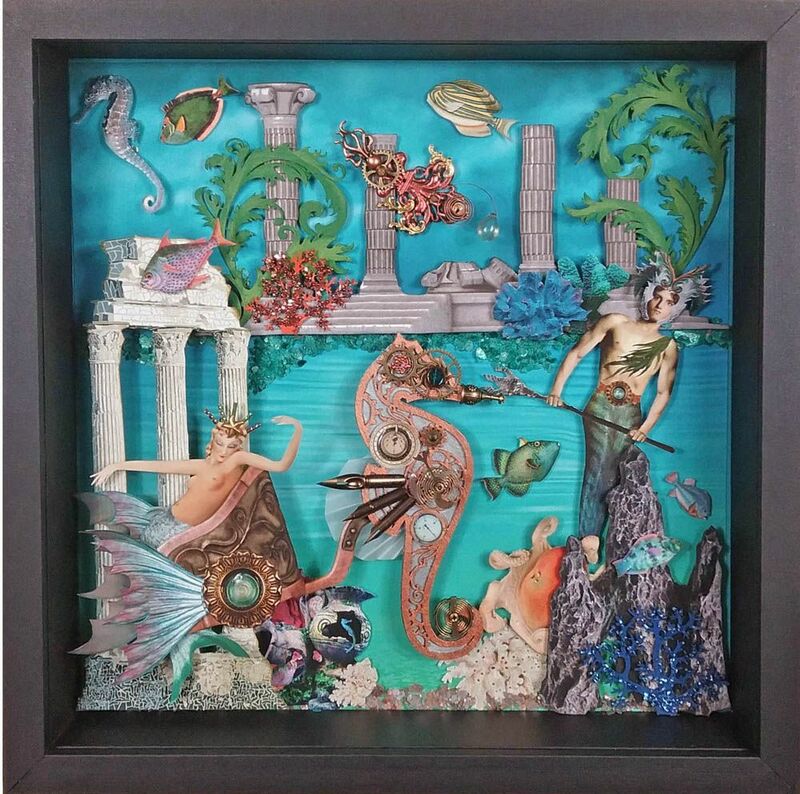 With a series of three 12 x 12 framed collage pieces, I’ve depicted the remnants of the fabled city of Atlantis, lying at the bottom of the ocean, now the domain of mermaids and mermen. 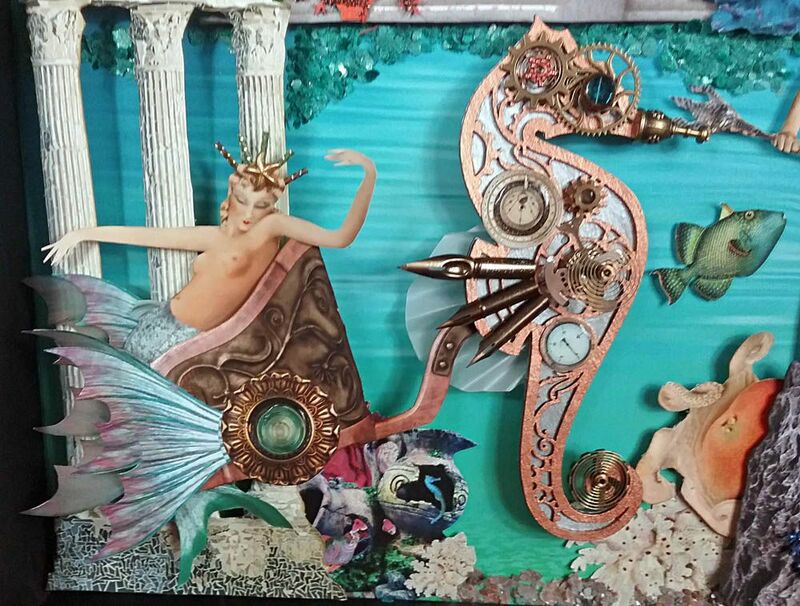 This underwater world has a steampunk twist as I imaged the merpeople would adopt the Atlanteans technology. 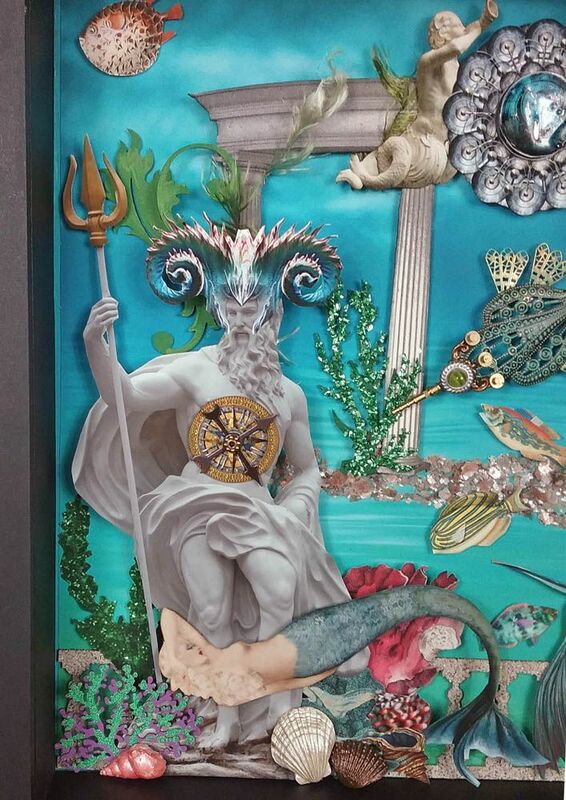 A statue of Poseidon stands guard over the ruined city while mechanical fish and crustaceans swim through the water and walk on the ocean floor. 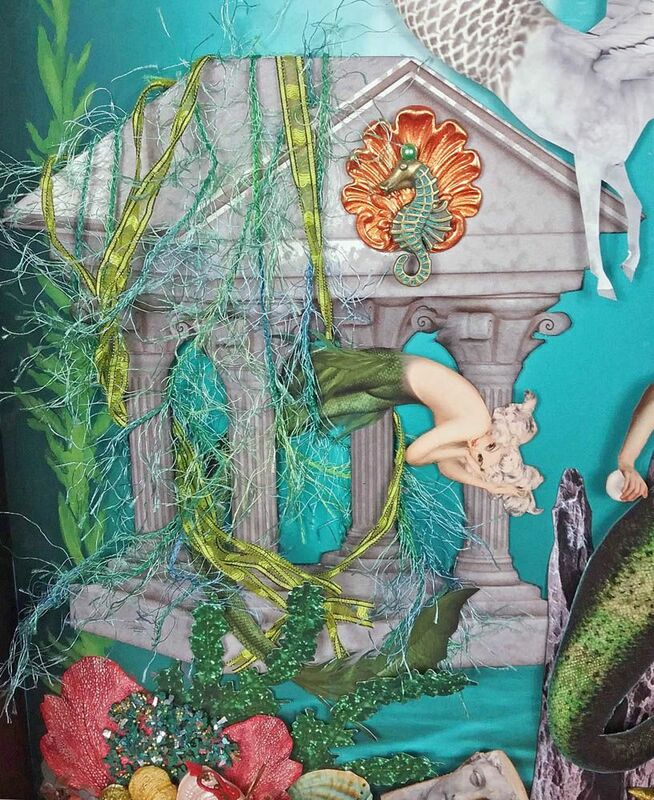 A mermaid frolics in the Temple of the Seahorse while her companion searches for pearls. 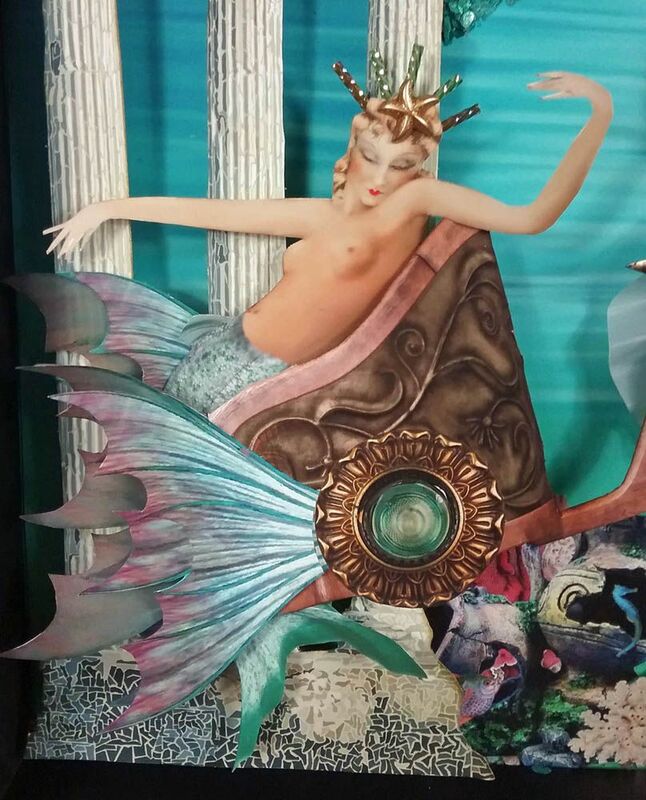 The Queen lounges in her chariot pulled by a mechanical seahorse with her faithful guard nearby. 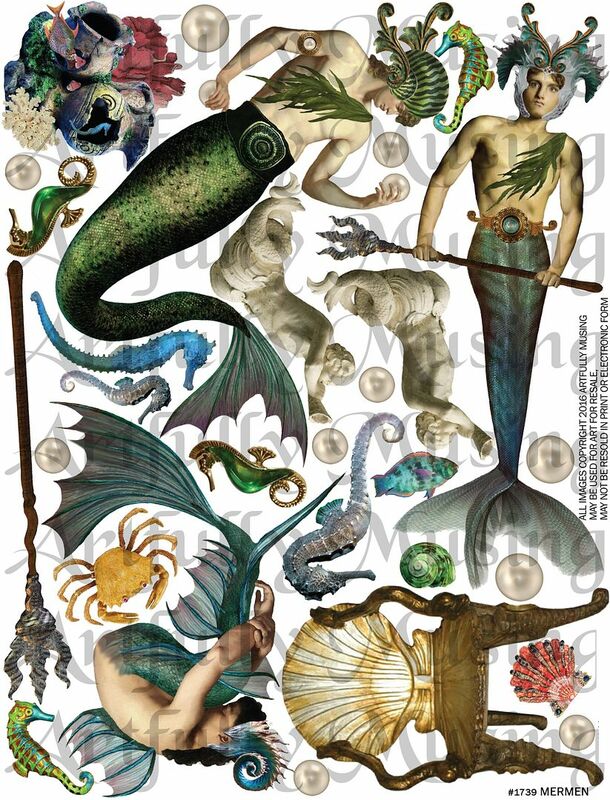 Last year I create a series of mermaid-themed collage sheets. 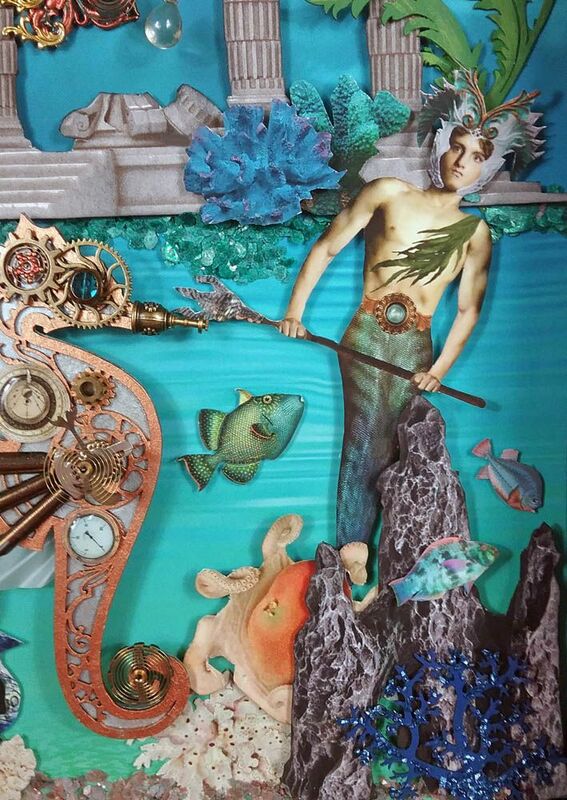 This year I thought I would add to the series with a merman themed collage sheet. 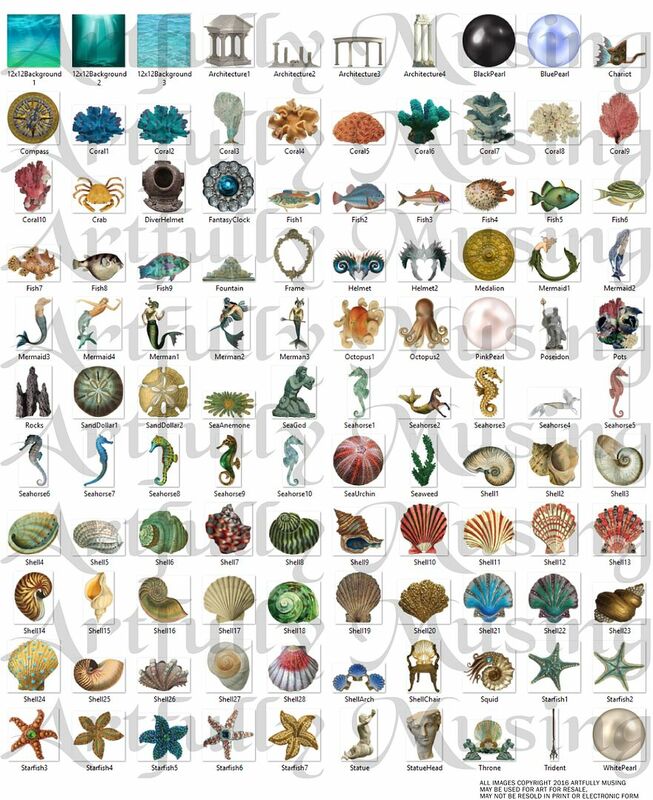 The collage sheet contains 32 tails of various sizes and colors. 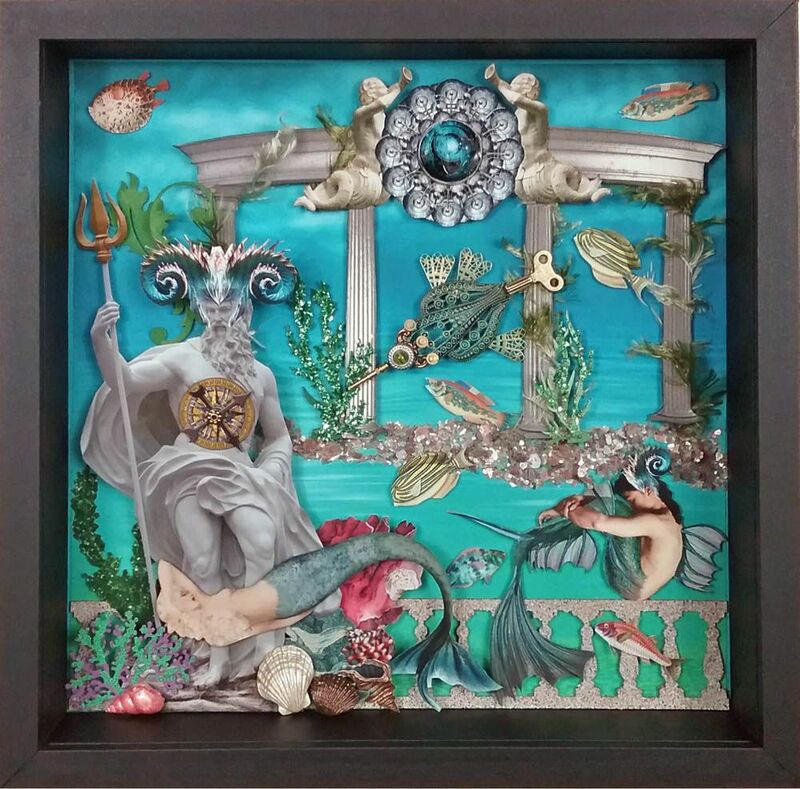 The mages you see in the three framed pieces are from the Mermaid Garden digital image set. 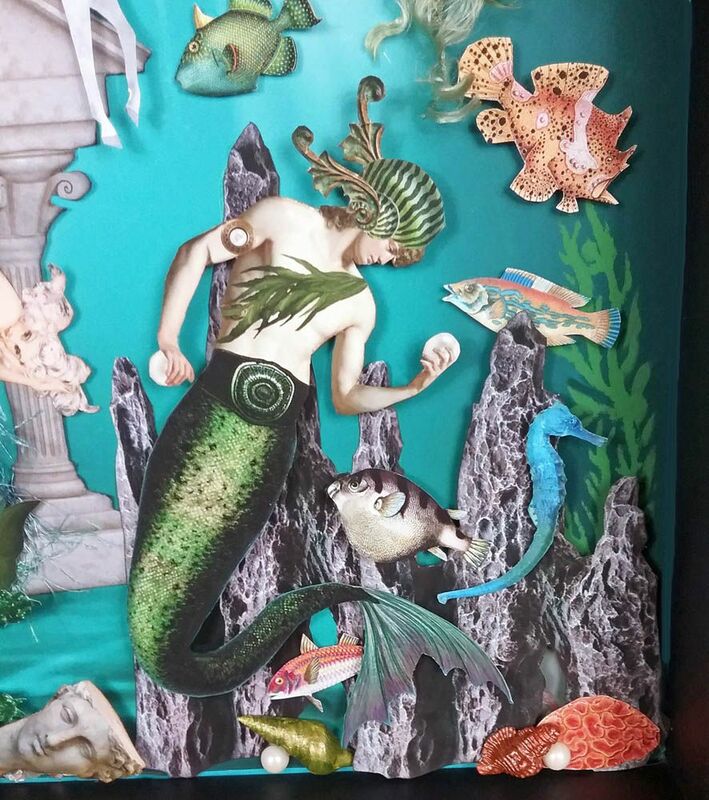 You can also find many of the images on the series of Mermaid Gardens collage sheets and the Merman collage sheet. 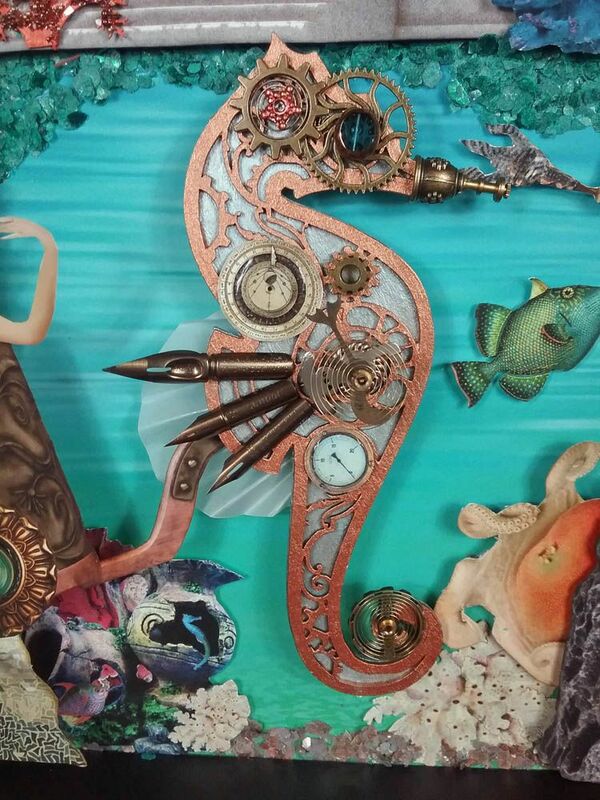 The only exception, are the gauges on the large steampunk seahorse which are from the Steampunk Elements collage sheet or the Steampunk Elements digital image set. 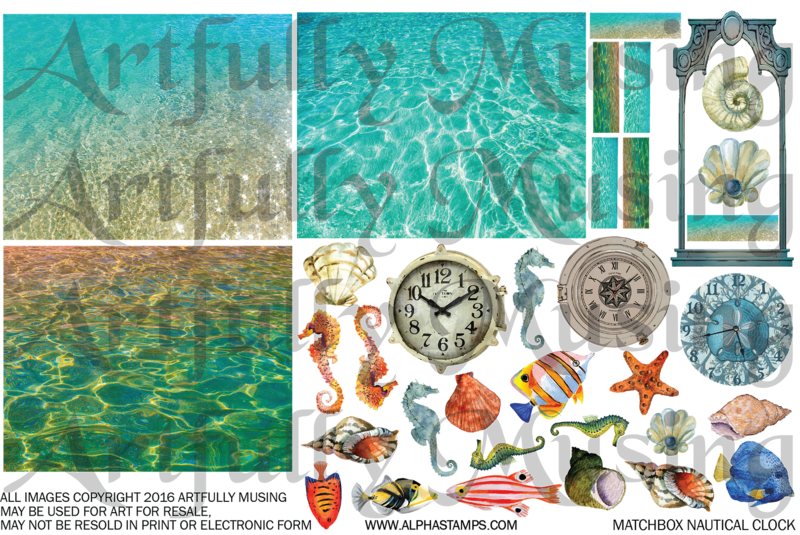 The background images are from the Mermaid Garden digital image set. To create more dimension I popped all of the images using double stick foam tape. 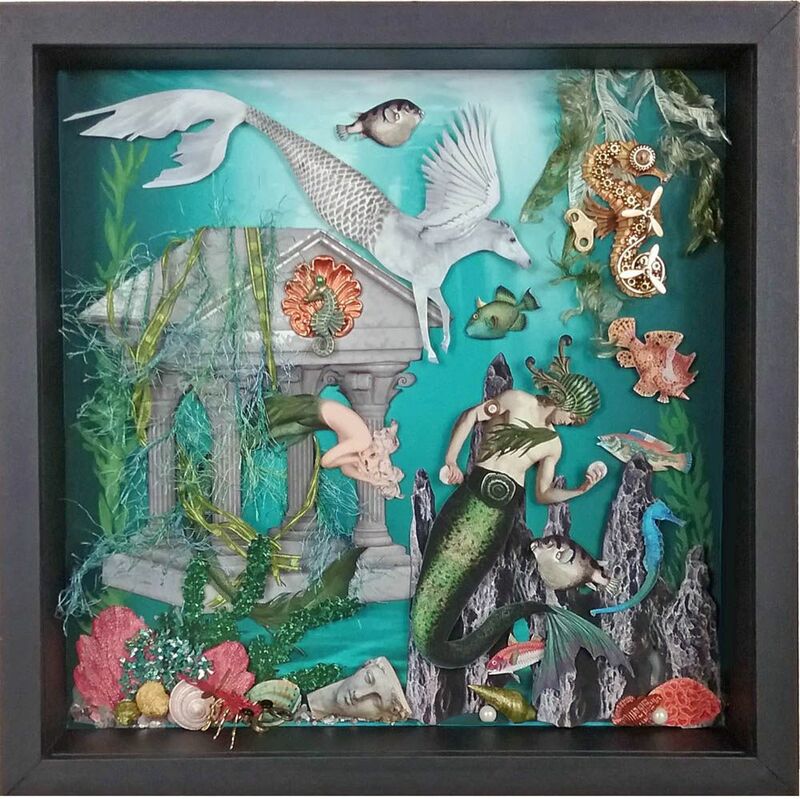 Each piece is showcased in a shadowbox frame that has a 12 x 12 opening. Many times you can find these frames in stores that carry scrapbook supplies as they are used to frame a 12 x 12 scrapbook page. I removed the glass so that the view of each piece is not obstructed by a glare. I added spinners and a rondelle to the compass on Poseidon chest. At the top of the colonnade is a steampunk clock. I used Glossy Accents in the middle to create a shiny dome effect. Flanking the clock are two statues. 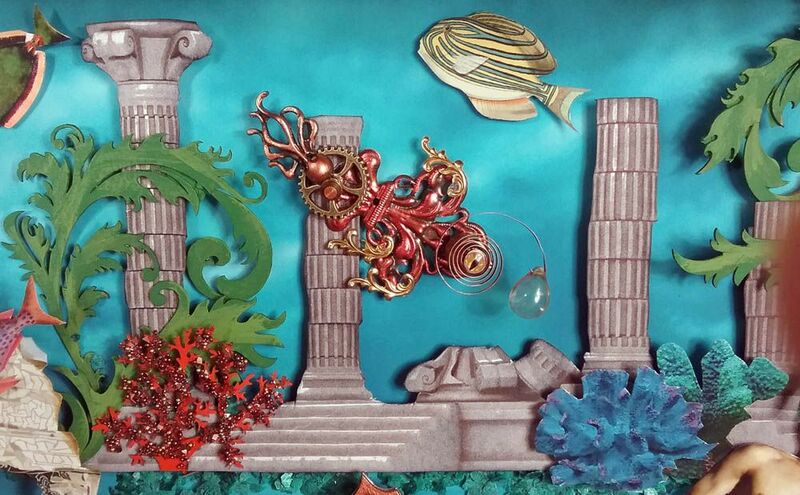 Swimming in front of the columns is a steampunk fish. 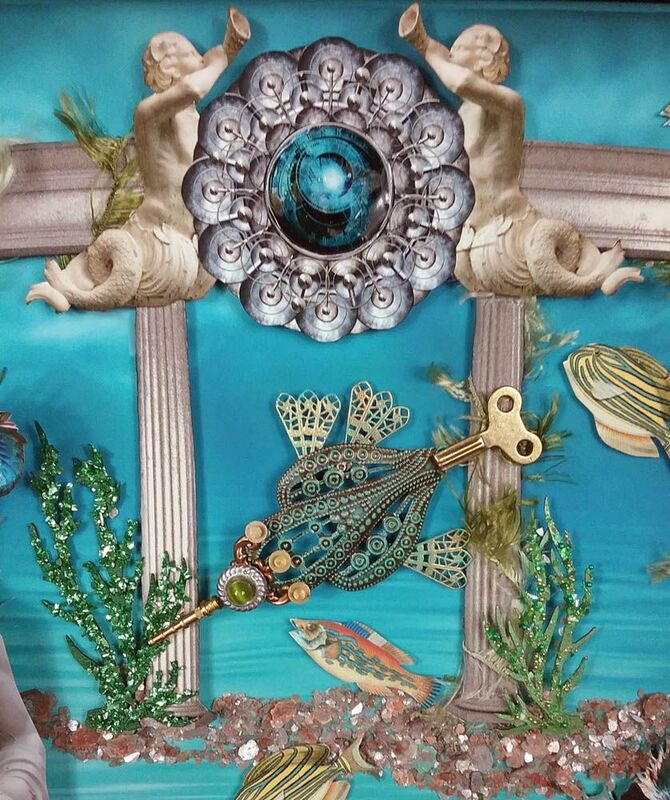 The body of the fish is a piece of brass filigree (it comes in a set ) rubbed with Patina Gilders Paste. 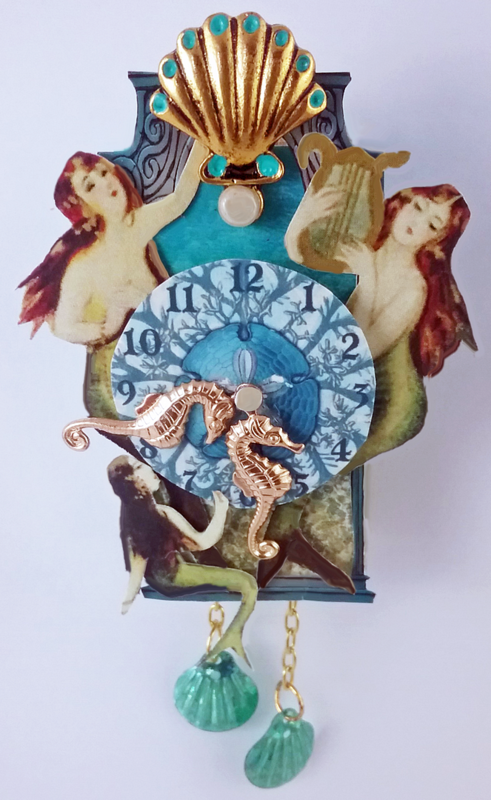 I used filigree fans as fins, a skate key as the tail, a brass drop for the face, a rondelle (painted silver) and an olivine cat eye bead for the eye and watch parts for the nose and face. Sleeping on the balustrade is a merman guardian with his partner sleeping nearby. The balustrade is made from a die-cut chipboard painted with stone texture spray paint. On the left-hand bottom of the picture below, you’ll notice some 3-D shells. The shells are made from paper clay and a silicone mold. I painted the shells with various colors of Liquid Pearls paint. 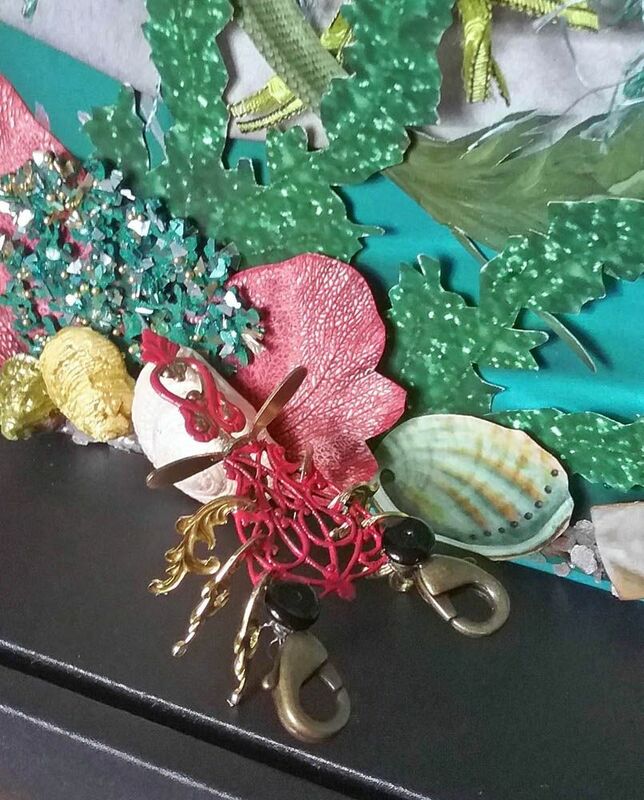 I incorporated some of these shells in each of the three pieces. The columns are wrapped with fibers that resemble seaweed and underneath are Mica flakes. 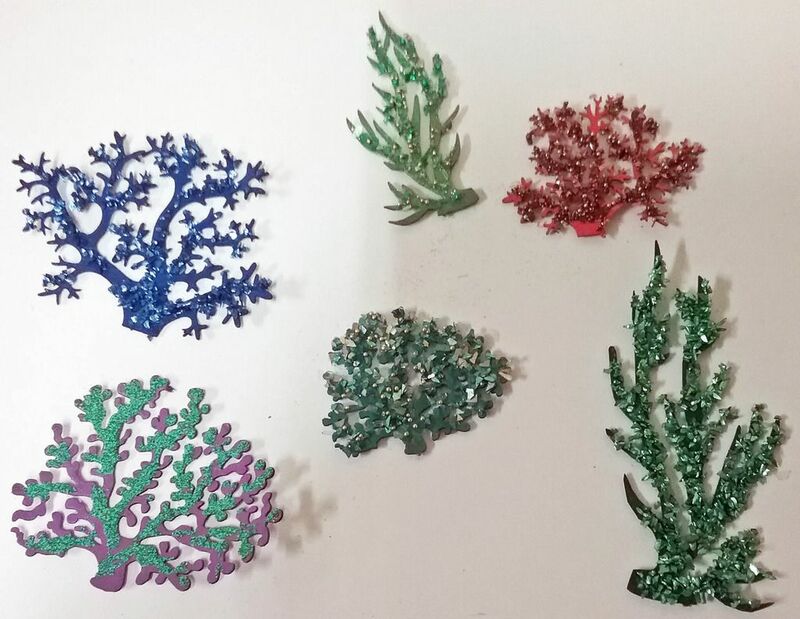 The sparkly coral and seaweed that you see in all three pieces are die-cut chipboard that I painted. Next, I dressed them up with mica flakes, glass chips, and microbeads. 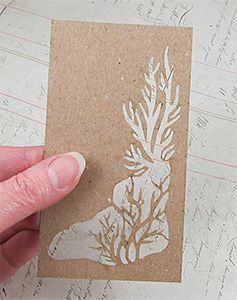 In the background, I used stencils to paint seaweed on the right and left sides of the piece. On the pediment of the Temple of the Seahorse, is a painted brass shell and a brass patina seahorse. Hanging over the temple is fiber seaweed. 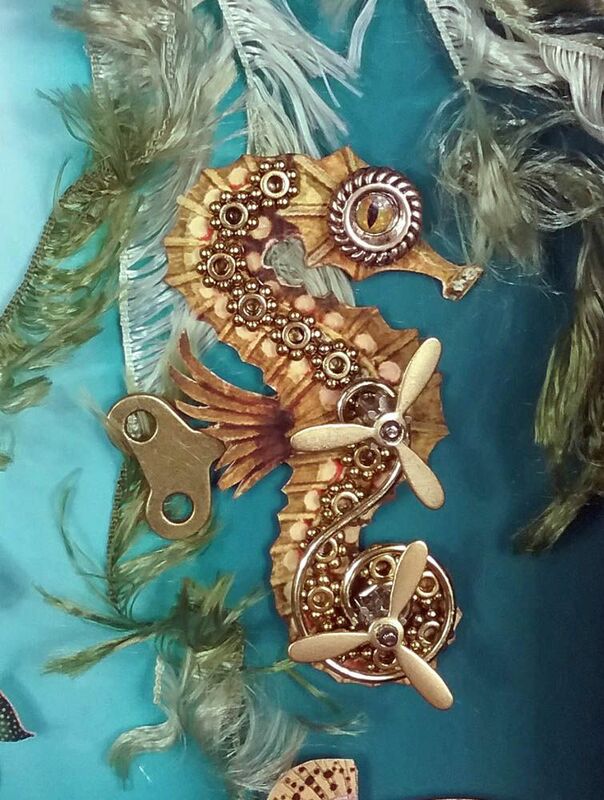 The body of the steampunk seahorse is an image. Along the length of the body are rondelles. On top of the rondelles at the tail is a swirl hook. 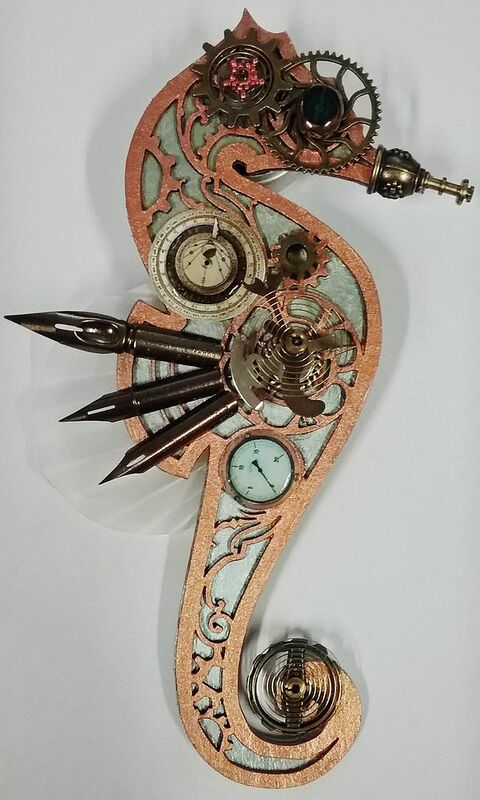 At two positions on the body, I attached watch parts and then glued propellers on top of the watch parts. To the back fin, I added a bronze skate key. The eye is a rondelle and a cat eye domed sticker. 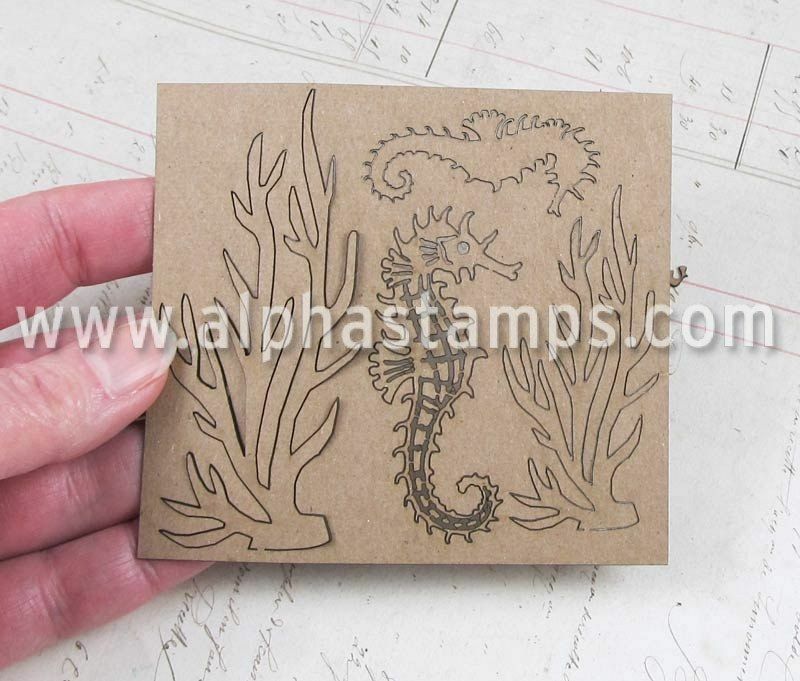 Behind the seahorse is more seaweed like fiber. 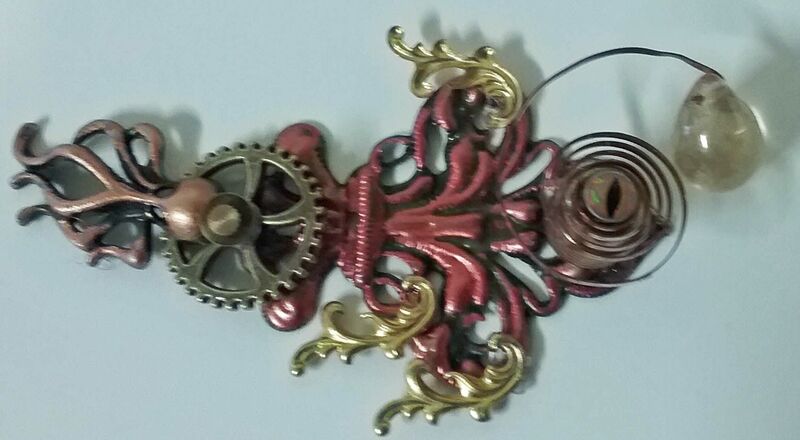 At the bottom of the piece is a steampunk lobster. 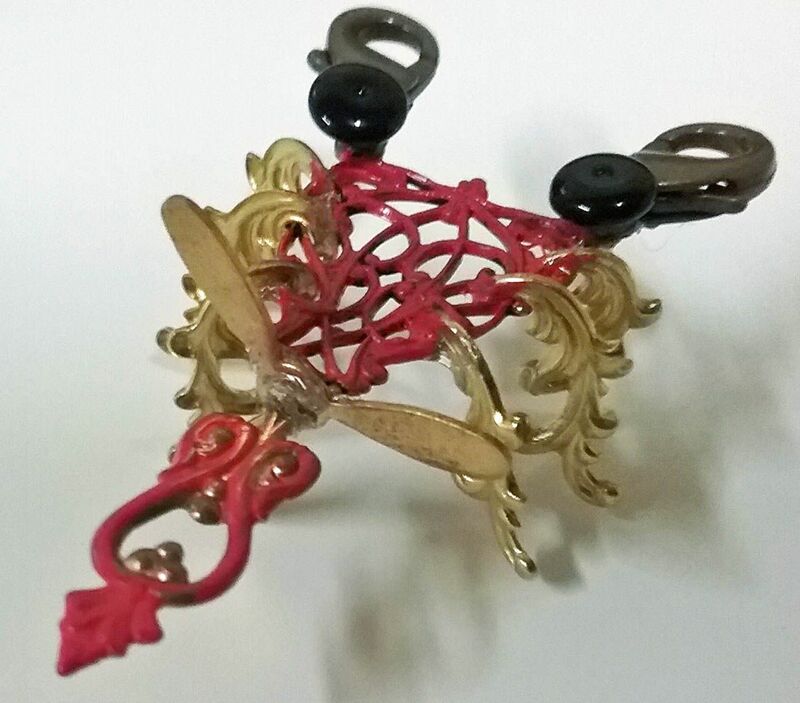 The body of the lobster is made from a piece of filigree. The tail is a Victorian drop or handle and a propeller. 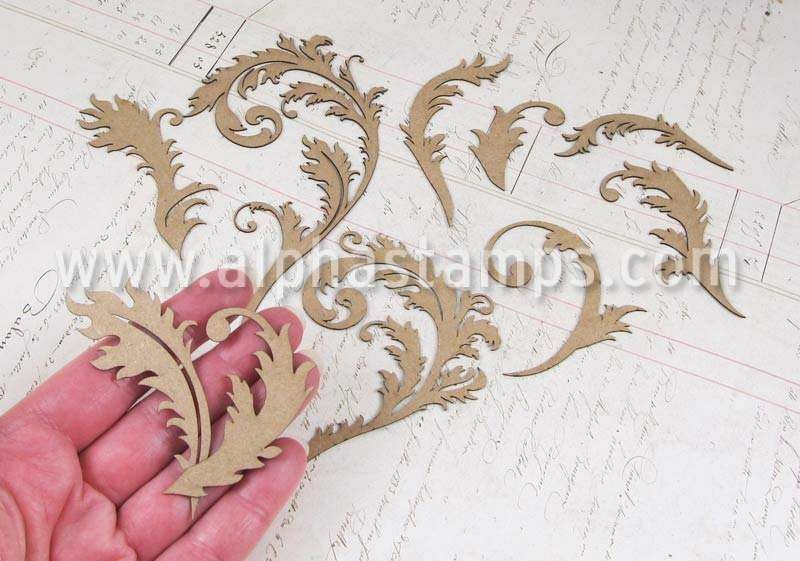 The legs are brass flourishes which hook into the holes in the filigree and are glued in place. The claws are lobster claw clasps and the eyes are black glass rondelles. The body is painted with Garnet - Metal Patinas Paint. 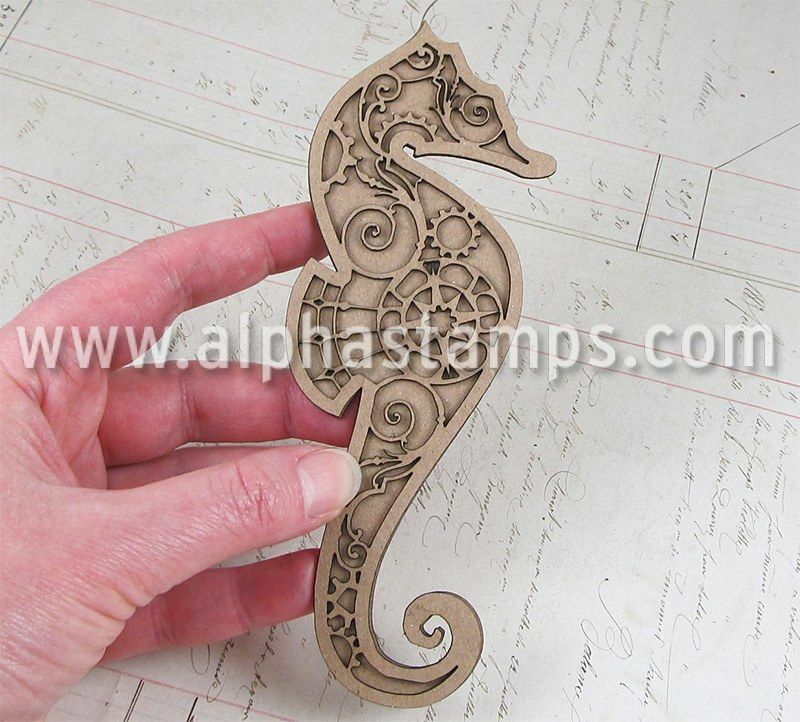 The base of the large steampunk seahorse is made from die-cut chipboard. It comes as a two-part set. 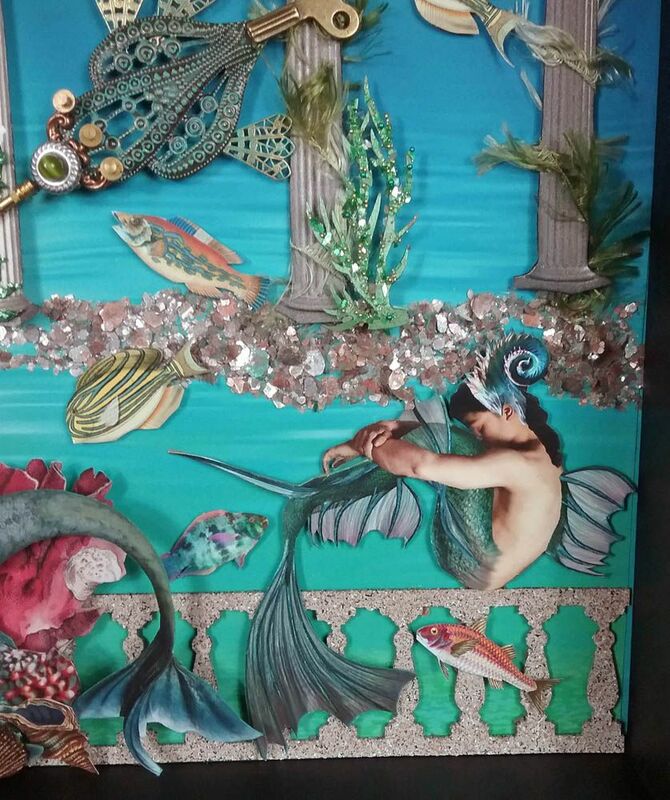 I painted the solid back piece a metallic blue color and the intricate top piece a metallic copper. I attached gears to the face, a dome bead cap and watch part to the snout. In the center and at the base of the tail are various watch parts. 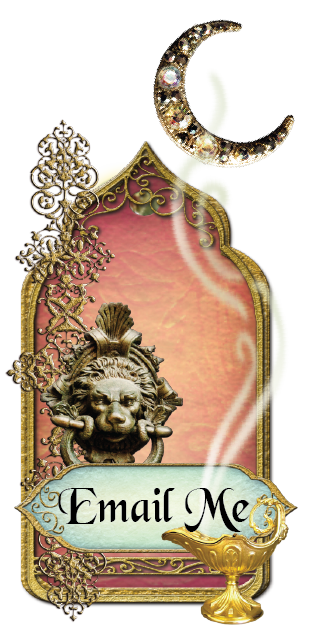 I also used gauge images from the Steampunk Elements collage sheet. I added Glossy Accents to the gauges to give them a 3-D appearance. I used pen nibs to accent the fins. 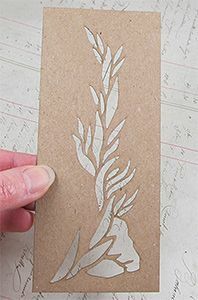 Behind the pen, nibs is a piece of vellum that I cut in a semi-circle and then accordion folded. To dress up the chariot, I added Glossy Accents to the center of the medallion. I printed the chariot twice on paper and once on vellum. I added the extra paper and vellum wings to the chariot to give it a fuller look. The queen’s crown is made from a brass starfish and beads. 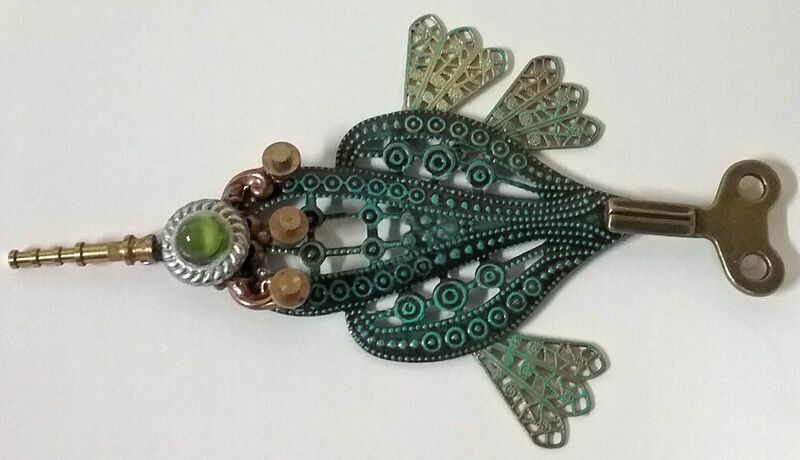 The body of the fish is made from a piece of filigree that is part of the same filigree set as the first fish. 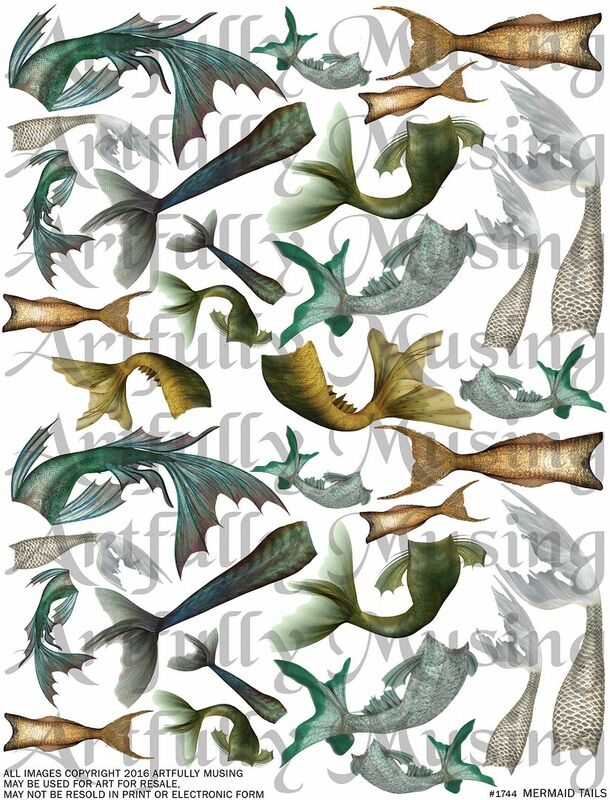 All of the pieces in the filigree set would make great fish. The fins are brass flourishes. 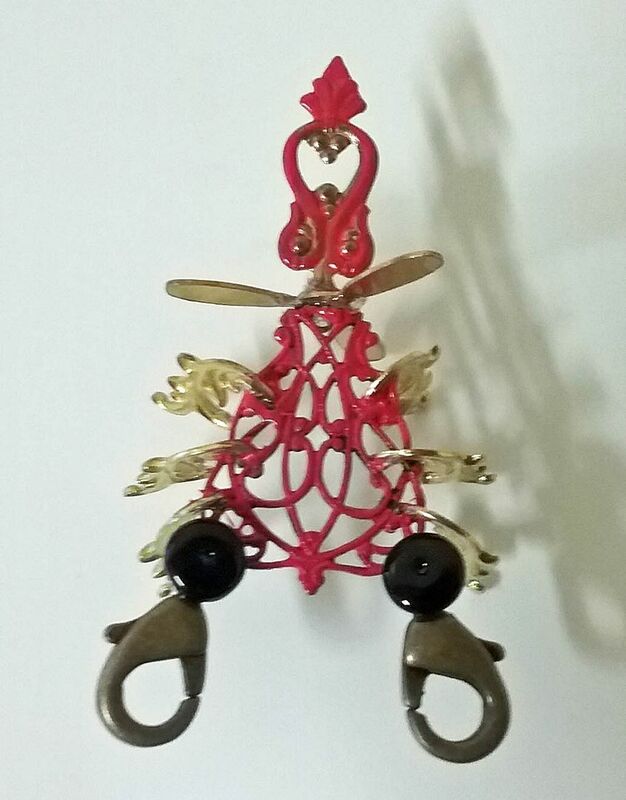 The tail is made from a gear and an octopus charm. The face is made from watch parts, a bead, and a domed cat eye sticker. 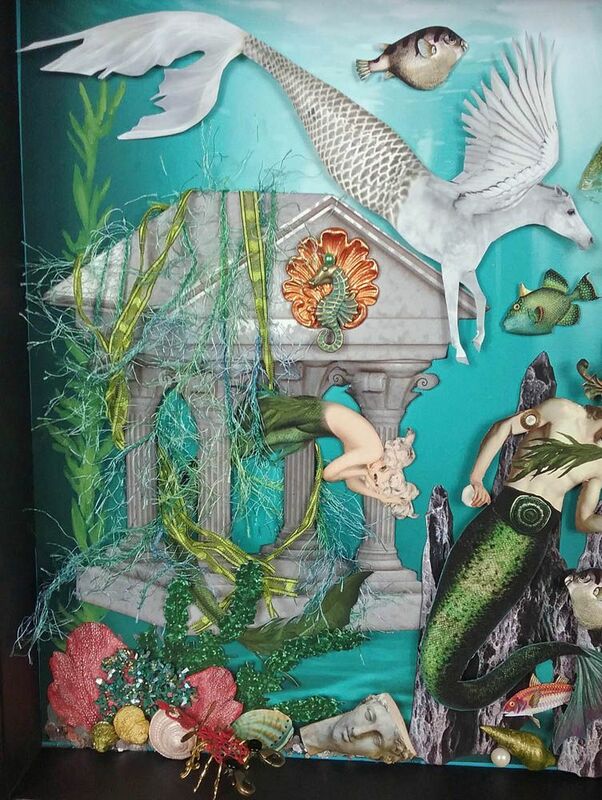 I used die-cut chipboard feathery flourishes as seaweed to accent the columns. At the base of the columns are Mica Flakes. Good things come in small packages and this one is no exception. If you are looking for a special way to present a small gift, how about making a gift box from a mini kraft treasure chest. 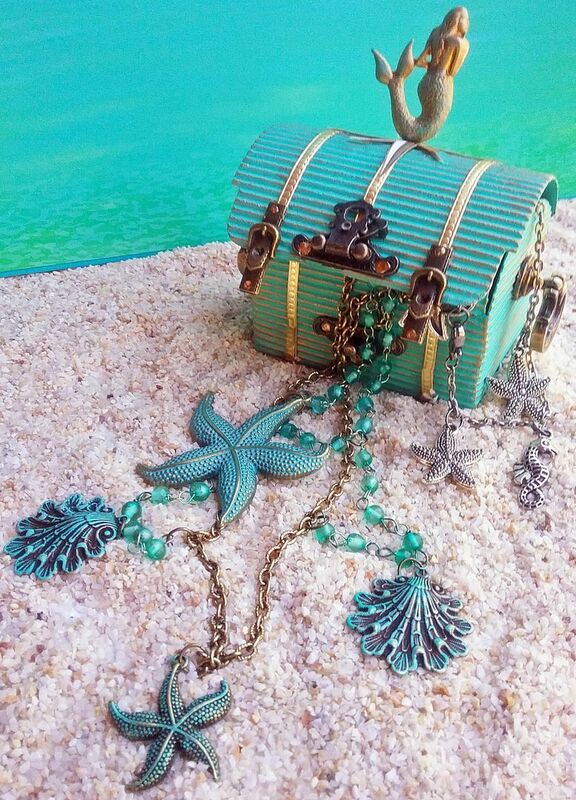 My version of a gift box is mermaid themed and contains an ocean themed necklace and bracelet. 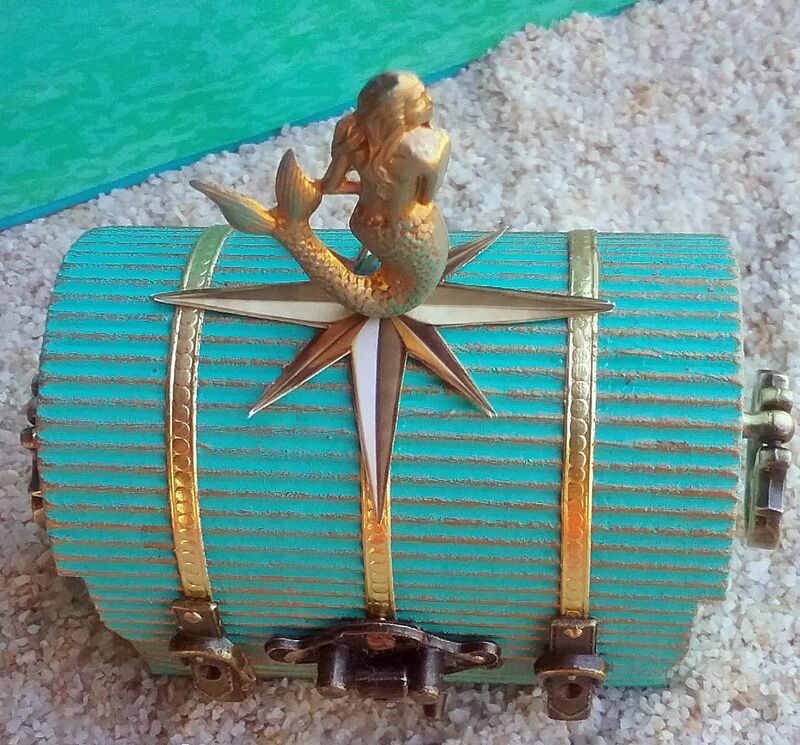 Below you can see the undecorated chest which would work for whatever theme you have in mind. 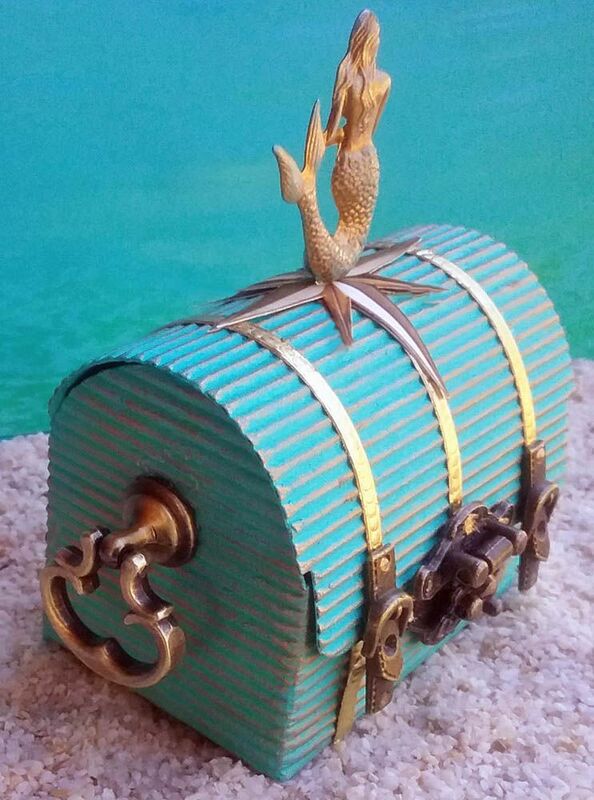 I started by painting the chest using teal acrylic paint, then rubbed the raised areas with Inca Gold Gilders Paste. The straps are Dresden borders. To add more interest to the straps I added bronze buckle connectors. The closure is fancy mini latch set. On the sides, I attached small swivel drawer handles. 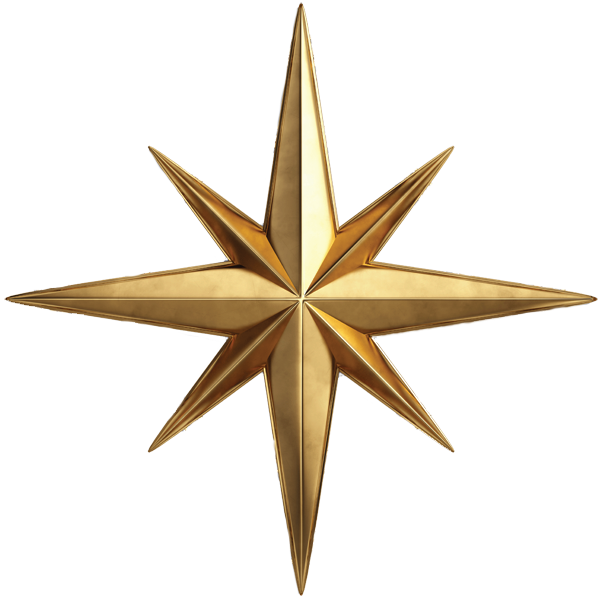 At the top is a paper compass star which you will find below. Feel free to download and use it in your art. 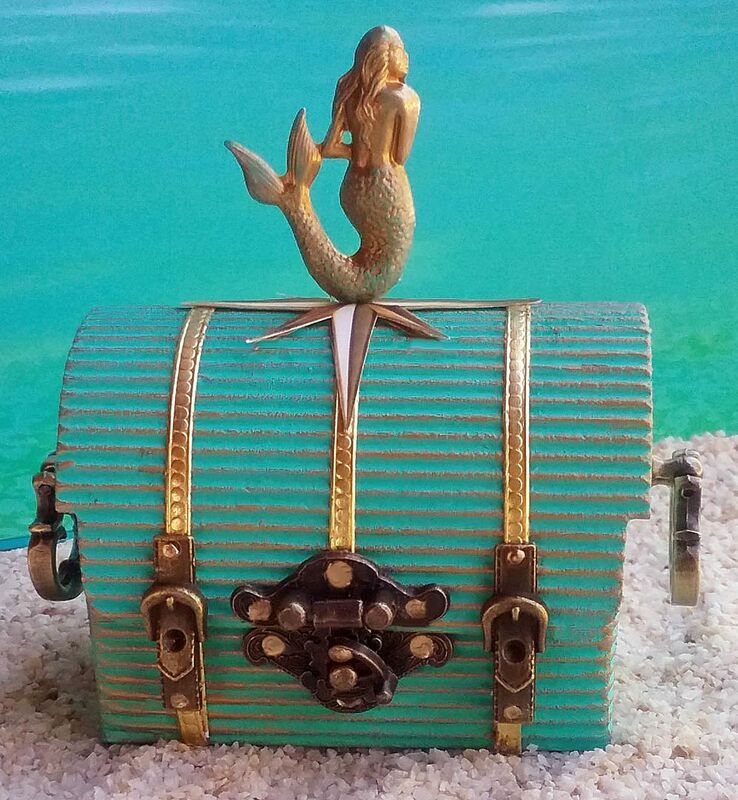 Attached to the top is a brass mermaid rubbed with Patina Gilders Paste. The necklace sports a couple of starfish and brass shells. The larger starfish comes in the patina color. 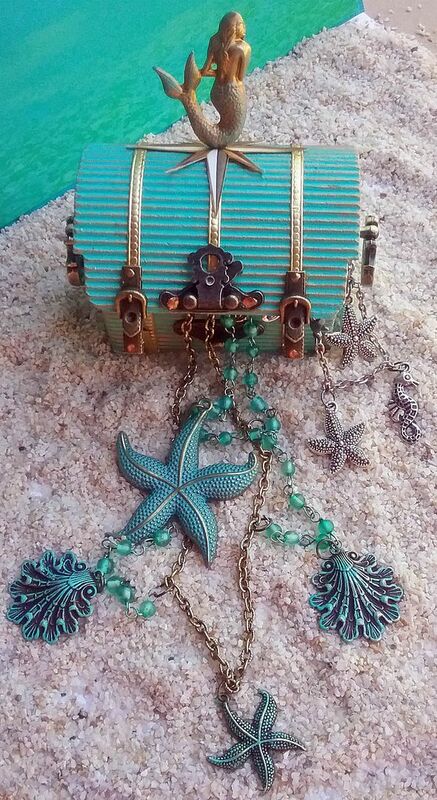 To coordinate the other starfish and shells, I rubbed them with Patina Gilders Paste which gave me a perfect color match. The to achieve a matching color on the rosary chains, I used Clover Alcohol Ink. To dye the beads, make a bath of the Alcohol Ink and Blending Solution, you just need enough to cover the beads. Drop the beads in the bath and leave them for about 5 minutes. Carefully remove the beads from the bath making sure you don’t touch the beads (I used tweezers and grabbed the chain part). Hang the beads to dry (about 30 minutes). The nice thing about Alcohol Ink is, that if the bead is transparent, it will still be transparent after you apply the ink. With this technique, your beads can be matched to the color of your jewelry or art piece. 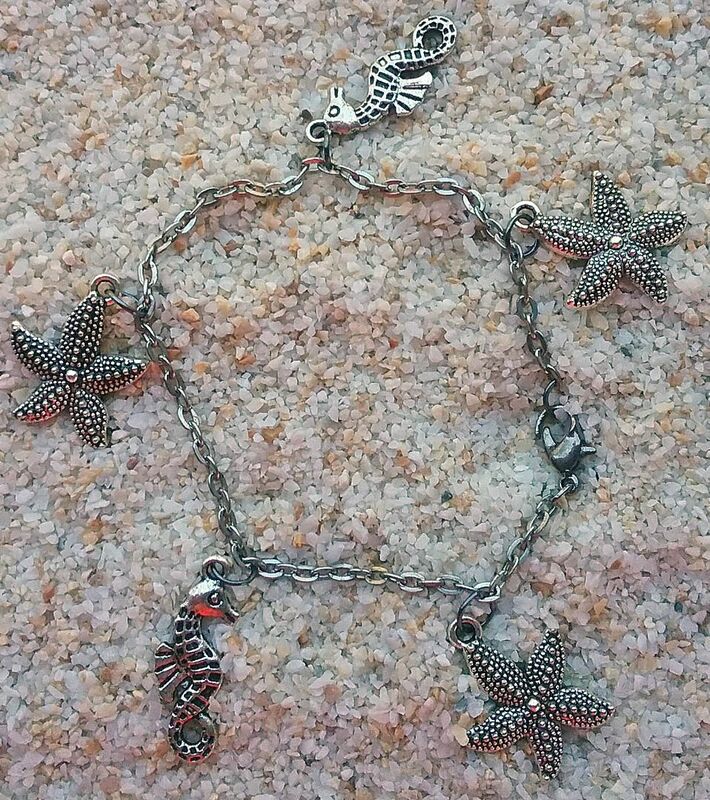 The simple bracelet below sports antique pewter starfish and antique silver seahorse charms. 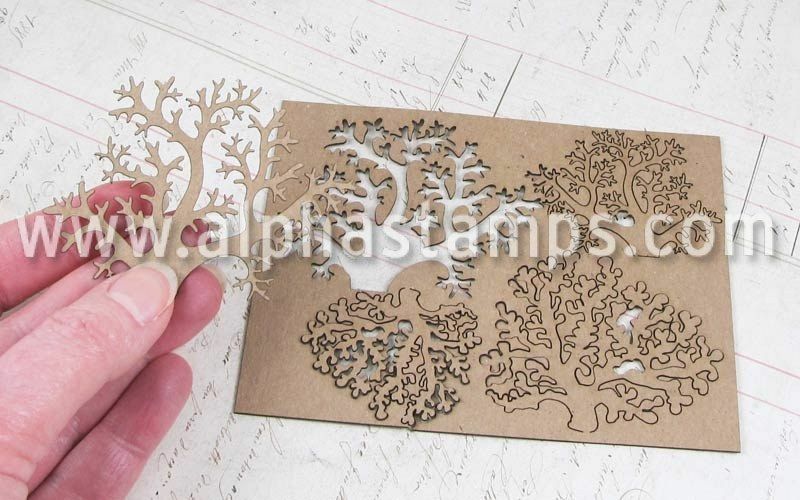 Below are two samples using the Matchbox Nautical collage sheet. 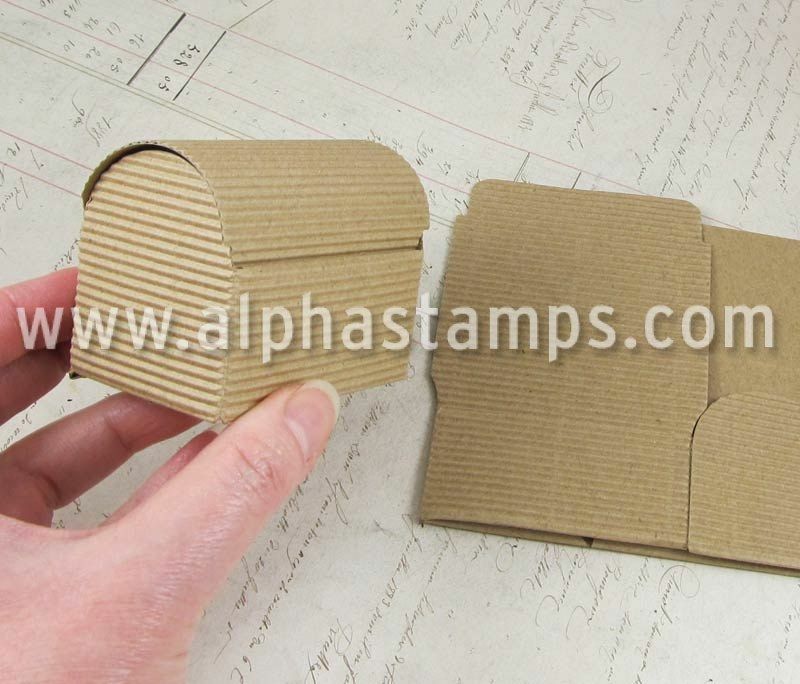 The sheet is designed to fit the narrow matchboxes carried by Alpha Stamps. On the sheet, you’ll find 3 water papers that wrap perfectly around the matchbox as well as water paper pieces for each end. 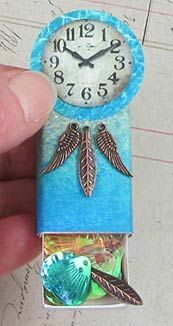 To decorate the box or to build your own matchbox clock, I’ve included lots of shells, fish, clocks and a frame that is sized to fit the box.